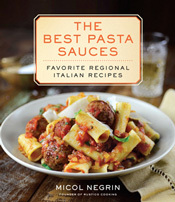 Puglia is a large, fertile region that forms the heel of the Italian boot. Unlike nearly all other Italian regions, which are mostly hilly and mountainous, it is relatively flat; in its sprawling Tavoliere Plain, much of Italy's wheat and other grains are grown. Two of Puglia's most important cities, Bari (the regional capital) and Brindisi, were already central ports at the time of the ancient Greeks and Romans. While cities along the coast (Bari, Taranto, Foggia, Lecce, and Brindisi) are the most densely populated, the areas most heavily visited by tourists are the dreamlike promontory of the Gargano Peninsula and the city of Alberobello, which is home to thousands of unusual stone houses with conical roofs. Three things are essential to the Apulian kitchen: wheat, vegetables, and olive oil. Semolina flour is transformed into a variety of handmade pastas (some shaped like little ears, others like concave shells, others still like thick ropes) which are boiled with wild or cultivated greens, tossed with hearty meat ragùs, or cooked into soups. Wheels of rustic bread are baked in the ovens of Altamura and other Apulian towns, to be enjoyed as companions to daily meals and serve as the starting point for numerous appetizers, salads, soups, and simple desserts; the most interesting offering is frisedda, a twice-baked ring-shaped bread. And almost every dish (from sublime tomato-topped bruschetta to lamb baked with bitter onions and potatoes) is doused with olive oil: after all, Puglia is Italy's largest producer of olive oil. Fava beans, Apulians' favorite legume, are transformed into thick soups, refreshing salads, and comforting side dishes, and rice is baked with potatoes and seafood or vegetables to make an unusual main course called tiella (named after the pot in which it is cooked). Sea urchins are savored raw in the port city of Taranto, flavored with a squeeze of lemon to underscore their briny flavor. The Apulians, shepherds by trade since ancient times, tend to prefer lamb, mutton, kid, and goat, which they cook simply with fragrant herbs, olive oil, and perhaps a handful of tomatoes or potatoes. Offal too is prepared ingeniously: lamb's hearts, lights, and intestines are skewered and cooked on a blazing grill, then eaten with raw celery and sharp sheep's milk cheese. And when it comes to sweets, the Apulian appetite for honey, nuts, and dried fruit gives rise to a number of pastries, cakes, and fritters with roots in ancient Greece and echoes of the Orient. Apulians use a wide variety of wild and cultivated greens in the kitchen. Some, like sorrel, are relatively mild and astringent; others, like broccoli raab and dandelions, can be bitingly bitter. 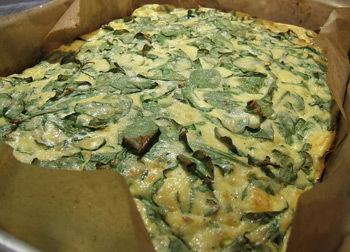 Apulians tame the bitterness of these potent greens by lengthy cooking. Like all Italians, Apulians don't believe in undercooking vegetables; they prefer vegetables slippery soft, never crunchy. Bitter greens are typically boiled first in ample water, then sautéd slowly in plenty of olive oil; the result is a mass of tender greens with only a pleasant note of bitterness. The greens are then served on their own, plated as a side to a puree of fava beans, folded into pasta, or spooned into soups. 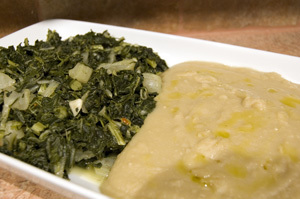 This is the classic fava bean puree of Puglia, served alongside garlicky, olive oil-smothered greens. Be sure to slip the skins off the fava beans before cooking. Don't make this puree with fresh fava beans, only with dried beans imported from Italy for the most authentic flavor and texture. This was subsistence food in Puglia for centuries, and remains one of the region's classic dishes. You can drizzle chili oil over the top when serving if you like your food spicy. Make the fava beans: Rinse the beans and slip off any skins. This takes patience but is necessary; if the skins are left on, the puree will have a gritty texture. Rinse the beans again and soak in cool water to cover overnight at room temperature. Drain, discarding any stones or other foreign particles that rise to the top. Rinse one more time. Place the beans, fresh water to cover by 2 inches, the peeled onion, salt, and pepper in a large, heavy pot. Set over medium heat and bring to a boil. Simmer, covered, until very tender, about 2 hours, adding the flour or semolina flour halfway through cooking and stirring once in a while. Using a slotted spoon, skim off any foam that rises to the surface of the water.The beans should always be covered by some water; add more water as needed. The flour or semolina flour is added to make the puree richer and creamier in texture, but can be omitted (this is a trick I learned in the Pugliese town of Altamura, from a young chef named Tommaso, whose fava bean puree was the best I have ever tasted). Pass the fava beans through a food mill, or process in a food processor or blender, until smooth and creamy. The texture should be similar to polenta: rich and dense, not runny. If needed, add a bit of water to thin it out, or hold back some of the cooking liquid if the mixture seems too soupy. Make the greens: Bring 4 quarts of water to a boil. Add the greens and 1 tablespoon of the salt. Boil 10 minutes, then drain and set aside. Do not squeeze dry. Warm the olive with the garlic in a deep, wide skillet over a medium flame. As soon as the garlic releases its aroma, add the greens. Season with the remaining 1/2 teaspoon of salt, add the water, and cover. Cook the greens for 30 minutes, adding water as needed to prevent the greens from sticking. Uncover, adjust the seasoning, and cook a moment or two longer over brisk heat if there is too much liquid in the skillet; the greens should be moist, but not soupy. Discard the garlic cloves. Celery is often overlooked in the kitchen. 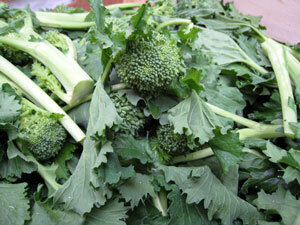 It tends to play a supporting role in many dishes as an aromatic vegetable, but almost never takes center stage. Here celery becomes the focus of a simple sauce that has a deep, haunting flavor. Make the sauce: Bring 5 quarts of water to a boil. Add the celery and cook 5 minutes, or until soft. Drain, reserving the boiling water to cook the pasta later. Place the olive oil and garlic in a deep, wide saucepan large enough to accommodate the pasta later. Cook over medium heat until the garlic is aromatic, about 30 seconds. Stir in the tomato sauce and water. Season with the salt and pepper. Bring to a gentle boil, then stir in the boiled celery. Cover and cook 15 minutes, or until the sauce smells rich and aromatic and has taken on a slightly lighter color. Adjust the seasoning and keep warm. 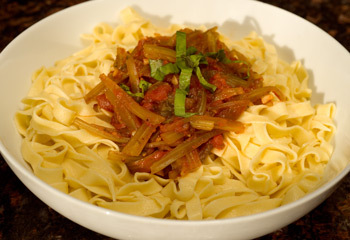 Make the pasta: Return the pot of water in which you cooked the celery to a boil. Add the salt and the pasta, and cook until al dente; drain into a large bowl, reserving about 1 cup of the pasta cooking water. 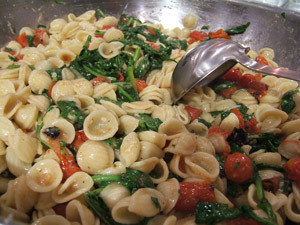 The Pugliesi make wonderful frittate with all manner of vegetables; arugula is especially tasty, and mates beautifully with sharp Pecorino cheese thanks to its peppery bite. Bring 1 quart of water to a boil. 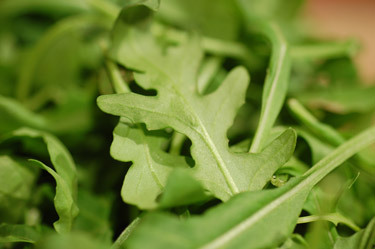 Drop in the arugula and cook 1 minute, or just until limp; drain and cool under running water, then squeeze dry and chop coarsely. Set aside. Generously grease an 8-inch square brownie pan with olive oil. Preheat the oven to 350 degrees. In a large bowl, beat the eggs, salt, pepper, Pecorino, and Ricotta until almost (but not quite) smooth. Stir in the arugula and pour into the prepared pan. This makes a great one-dish meal on a hot summer night. If you like, add half of a minced garlic clove to the tomato mixture before folding in the pasta. Toss the arugula, tomatoes, garlic, olive oil, 1/2 teaspoon of salt, and the pepper in a large serving bowl; set aside for 30 minutes to 2 hours at room temperature. When you are ready to serve, bring 5 quarts of water to a boil. Add the penne and remaining 2 tablespoons of salt, and cook until al dente; drain. 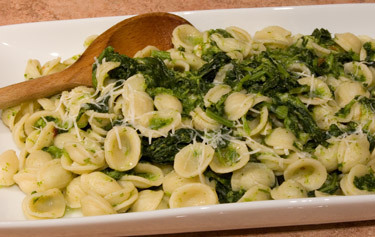 Orecchiette are an ear-shaped pasta prevalent in southern Italy, especially Apulia, and are often paired with greens or vegetables such as broccoli, broccoli raab, and cauliflower; feast-day orecchiette call for robust meat sauces instead. Heat the olive oil in a small skillet over a medium-low flame. Add the garlic and cook 10 seconds; stir in the anchovies and crush them into the olive oil with the back of a fork. Fold in the chili and keep warm on the lowest possible flame. I enjoyed this risotto at Trattoria da Mimmo in Vieste, a seaside town in the Gargano Peninsula. The Gargano is the spur of Italy's boot, a breathtaking area of rugged mountains and pristine coastline. In a large bowl, soak the cockles and mussels in water to cover with 1 tablespoon of the salt for 30 minutes. Drain and rinse thoroughly (this is essential to get rid of sand and impurities). Rinse thoroughly. Place the cockles and mussels in a 2-quart pot with 1/2 cup of water and cover with a lid; cook over medium heat until they open, about 8 minutes, shaking the pot every minute or so. Remove from the heat, cool a few minutes, and shell; transfer to a bowl, discarding the shells and any unopened cockles and mussels. Strain the cooking juices in the pot through a cheesecloth-lined sieve into the bowl with the shelled cockles and mussels. Heat the olive oil in a heavy-bottomed 2-quart sauté pan over a medium-high flame (a copper pan is ideal). Add the garlic and chili; cook until aromatic, about 30 seconds, stirring constantly with a wooden spoon and making sure that the garlic does not burn. Add the rice and cook 3 minutes, stirring constantly. Deglaze with the wine. When the wine has evaporated, after about 2 minutes, add the tomatoes; cook 5 minutes, still stirring. 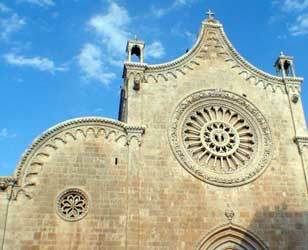 Puglia is Italy's most prolific wine producer, outputting an average of 340 millions of wine annually. 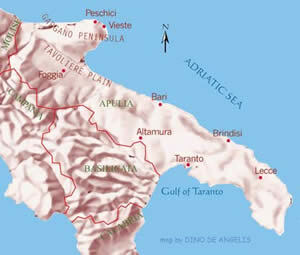 Brindisi: The red is characterful, harmonic, velvety, with deep tannins and a bitter aftertaste; the rosé has a fruity aroma and dry taste. Gravina: Zesty, delicately flavored white; vinified still and sparkling. Locorotondo: Subtle white best sipped in its first year; still or sparkling. Primitivo di Manduria: Intense, heady red vinified both dry and sweet; the Primitivo grape from which it is made is identical to California's Zinfandel. Salice Salentino: The Chardonnay-based white is fruity in scent; the Negroamaro-based red is full-bodied, has an intense aroma, and is best in its first 3 years. While sheep, goats, and water buffaloes yield memorable cheeses in Puglia, cows are responsible for the bulk of Puglia's cheeses. Many of these cheeses are best savored within hours of production; others mature for months until they acquire a delectably pungent character. Boscaiola del Gargano: Cow's milk cheese laced with chili pepper; aged 2 to 3 weeks. Burrata: Fresh cow's milk Mozzarella stuffed with cream; best eaten within 24 hours of being made. The most famous is from the town of Andria. Burrino (or Manteca): Fresh Provolone with a heart of butter; tied in pairs and eaten with celery and fennel, or enjoyed at meal's end for dessert. Canestrato Pugliese: Pungent, firm sheep's milk cheese aged from 2 to 10 months; it owes its name to the fact that it is shaped in molds called canestri. Canestrato is typical of the shepherds who traveled from Abruzzo and Molise to the plains of Puglia during a yearly transhumance in search of better pastures for their flocks. Mozzarella Pugliese: Creamy, fresh cow's milk Mozzarella; best enjoyed the day it is produced. Pallone di Gravina: Semi-firm cow's milk Provolone shaped like a ball. Provala di Bufala: Fresh buffalo's milk Provolone with a porcelain-white color and creamy texture. Primo Sale ("First Salt"): Soft, pale, fresh cow's milk cheese aged 1 to 2 days; salted only once, it still oozes whey. Ricotta Forte: Sharp, spreadable, fermented Ricotta; sometimes flavored with pepper and vinegar. 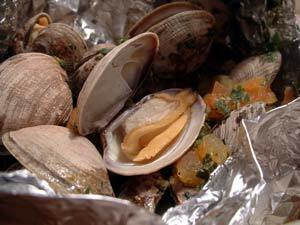 The one from the towns of Putignano and Altamura is especially delicious. Ricotta Marzotica: Cow's or sheep's milk Ricotta whose fermentation starts in March (hence the name); it sports a light coating of mold after 1 month of aging and can be smoked. Stracciatella: The rich, creamy stuffing of Burrata cheese served in majolica pots. Capocollo di Martina Franca: Pork shoulder and neck; chopped, salted, smoked, and flavored with cooked wine. Cervellata: Sausage made of pork, or pork and veal; flavored with cooked wine and fennel seeds, often grilled. Salsiccia di Lecce: Pork and beef sausage enriched with Pancetta (unsmoked bacon); flavored with white wine, cinnamon, cloves, and lemon zest. Sanguinaccio di Lecce: Blood and brain sausage; typically eaten boiled or grilled. Zampitti: Long sausages made from pork, beef, and lamb trimmings; often flavored with Pecorino or fennel seeds and best on the grill. Grotta delle Rondini: Porto di Peschici, 011/39/0884/964007. Eat on the terrace for a view of Peschici's port, but venture inside for a look at the swallows' grotto. Seafood and pastas are good if unpretentious. Hosteria del Sole: Piazza Curri 3, Alberobello, 011/39/080/4323904. The appetizers and seafood are very good. 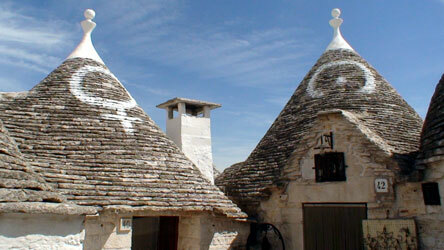 The restaurant is a few steps from the trulli (unusual stone homes with conical roofs) of Alberobello. Trattoria Da Mimmo: Via Cesare Battisti 33/35, Vieste, 011/39/884/707374. Mimmo makes outstanding first courses, and his home-preserved vegetables (served as appetizers) are tasty. Antica Salumeria D.C.A. : Corso Vittorio Emanuele II 28, Bari, 011/39/0805/211203. Take-away foods, cured meats, and cheeses at one of Bari's most renowned gastronomy shops. Azienda Agricola Franco Cuonzo: Corso Vittorio Emanuele 22, Bitonto, 011/39/080/608012. Some of the finest olive oil in Puglia is produced in Bitonto, and Cuonzo's is especially good. Azienda Agrituristica Monte Sacro: Five miles above Mattinata, 011/39/0884/558941. Prices are extremely reasonable, and the food is good. The visit is worthwhile just to watch the farmers make cheese every morning. Bread in Altamura: Large, chewy loaves of bread, already beloved by the ancient Romans; the one at Forno dei Fratelli di Gesù (Via E. Pimentel 15, Altamura, 011/39/0803/141213) is famous. Castel del Monte: Imposing castle built in the thirteenth century by Frederick II of Swabia; on the UNESCO World Heritage List. Martina Franca: A charming town with white houses; walk in the historical center, then head to the roof of the Palazzo Ducale for a panoramic view. 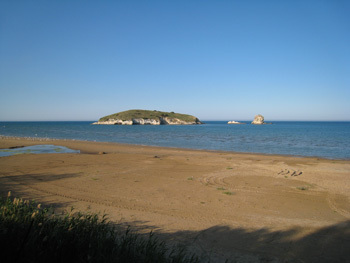 Pugnochiuso: Exclusive resort area in the Gargano Peninsula. Tarantello: Cured and spiced tuna; a specialty of Taranto. Troccoli: Chubby, long handmade pasta; lovely topped with tomato sauce and grated salted ricotta. Trulli: Unusual stone homes with conical roofs; there are thousands in and around the town of Alberobello (the town is on the UNESCO World Heritage List).